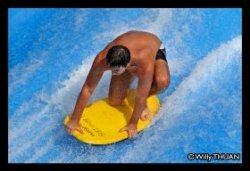 Surf House Phuket is the latest artificial wave sport in Phuket, the perfect way to learn the basics of surfing, wake boarding or even kite boarding without all the usual effort and often pain associated with. Here anyone can give it a try in just a couple of minutes and depending on your past experience and natural balance, you will be surprised how fast you can actually stand on these tiny flow boards. 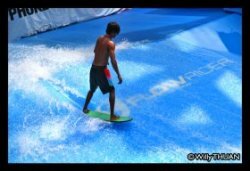 The Flow House at Surf House Phuket consists on two parallel high pressure water streams flowing up an inclined slope at very high speed, enough to create sufficient lift for a person. The water is barely ten centimeter deep and the bottom is soft, making any fall impressive but totally painless. With a perfectly consistent flow speed, the learning process is simplified. You can start from the top, use a body board and try to stand on it, or start on a small flow boards from the bottom up and hold the rope a trainer holds you with. Watching adults and kids playing is fun and very motivating and apparently everyone succeed… after very falls. The team of trainers are very good at guiding the newbies and kids seems to really love this sport. Surf House Phuket is also a place for food and parties with a DJ and a great ambiance music matching pretty well the young atmosphere of such active sport. Special events are held frequently until late. The price is high: 1, 000 baht/hour for the first time (200 baht for the registration + 1 hour 800 baht), 3 hours: 2, 000 baht, full day: 6, 500 baht. 450 Baht per Hour for members. Surf House Phuket also features a surf shop with flow boards, body boards and plenty of surf apparel. 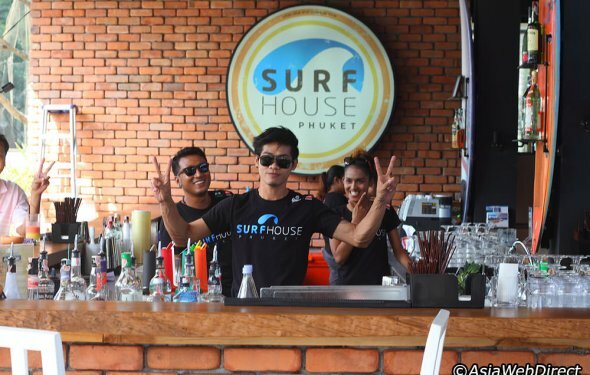 Surf House Phuket is open from 12 pm to 12 am and with such great music, plenty of drink and casual food, the place is often busy so come early if you don’t want to queue to long for some fun surf!